Loveall News! : Our Visit with Matt's Family! Our Visit with Matt's Family! 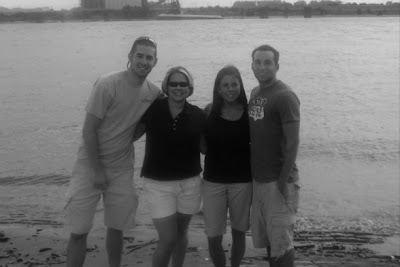 Matt's Aunt Terri, Uncle Nick, cousin (Cressie) and her boyfriend (Chase) came to town last weekend for a visit. It was so good to see them. 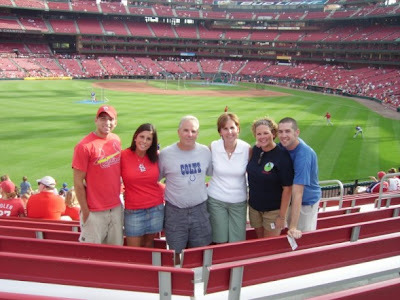 We all went to a Cardinal's game on Friday evening. We had a great time even though it was really hot and we had standing room only tickets. We were able to sit down around the 5th or 6th inning. It was really cool to be in the new stadium and Chase (Cressie's boyfriend) is a big Cardinals fan so I know he enjoyed it! Then on Saturday we took them to Ted Drews (St. Louis' famous custard) and to the arch Saturday afternoon. Saturday evening we just hung out watching movies and eating icecream! We had a great, relaxing time with them. We hope to spend more time with them because they are only a 5 hour drive away! This is the view from inside the stadium- pretty neat! Those are so good, Emily! I love the black and whites. 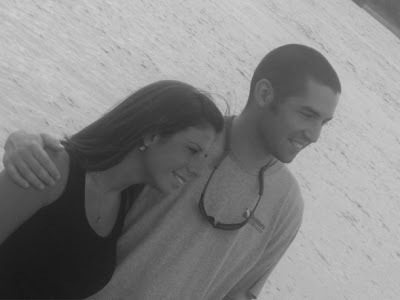 And, I think Matt and his cousin look alike! I'm so glad you guys got to spend some time with them!